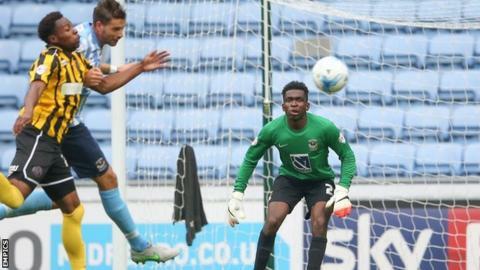 Coventry City have agreed a new two-and-a-half year deal with highly-rated young goalkeeper Reice Charles-Cook. The 21-year-old former Arsenal trainee has made a big impact in the seven games since making his league debut for City little more than month ago. "I've been delighted with Reice this season, on and off the field," said Sky Blues manager Tony Mowbray. "He is fully deserving of his new deal. "The club needs to protect its young assets and Reice is one of them." Charles-Cook was in the final year of his previous contract, having signed in July 2014 after a season with then League Two side Bury. He impressed last term on loan at non-league Nuneaton and is understood to have won admirers at two of the Midlands' three Premier League clubs, Aston Villa and Stoke City, as well Championship teams Middlesbrough and Nottingham Forest. He was given his chance by Coventry when first-choice keeper Lee Burge pulled out of the home game with Shrewsbury because of illness. "He started the season behind Lee Burge, but his desire and application on the training pitch was noticeable. And, having got into the first team he has taken his chance exceptionally well," said Mowbray. "There are still more improvements for him to make and by no means is he the finished product, but I'm sure with the hard work he puts in and with Lee Burge continuing to push him every day in training, the club is very healthy at the moment with two excellent young goalkeepers." Charles-Cook has already made Sky Blues history by becoming the first Coventry keeper to keep clean sheets in his first four league games. He was within five minutes of making it five in a row until Swindon Town scored two late goals to earn a 2-2 draw at the County Ground. It ended a run of 445 minutes without conceding a league goal - just when he was getting close to club legend Steve Ogrizovic's club league shut-out record, set 22 seasons ago.